Consistency would be an accurate description of how the Accelerate 3 athletes did in their age groups today at USAT’s 2011 Duathlon National Championships. In the older guys division (45-49) Billy finished 6th in his age group and 48th overall. One thing that is amazing about Billy is, as he has moved up in age groups he has gotten faster. He is faster now then he was at 40, 35 and 30. Billy is anti aging. He also has nice running form and rhythm. It probably doesn’t hurt that he does his track workouts with some of the best female triathletes in the world. 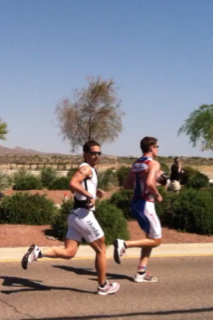 In the 40-44 age group Francois and I ended up leaving T2 next to each other. Francois turned in the 5th fastest bike split on the day to take 6th in the age group and 22nd overall, while I grabbed 5th in the age group and snagged the bottom step of the top 20 overall. Francois and I were :05 apart. 14th through 22nd place on the overall results sheet were separated by :56 seconds. It’s been a long time since I’ve race Duathlon Nationals. I was amazed at how tight everything was at the second turn around on the first run. Only the first two guys had cleared the field. Everyone else was strung together in groups of 4-8 runners with small time gaps. The other thing that surprised me was the fluidity of the groups around me. The group in front broke apart then my group swallowed them. Then half of my group got spit out the back. It seemed the first run was a constant catch the group in front, spit half out reform and repeat. I hit the second mile marker in 27th position in the wave with a 11:30 :01 back of Billy. T1 was a giant CF. There were people everywhere. It seemed like 30 people were all grabbing bikes rushing down the center aisle to get out. I left T1 with 2 people in front, one to my right side and two behind me, all of us wheel to wheel to wheel. But then I had to drop them enroute to the 13th fastest bike split of the day. See you later fellows. Not. My power output was 237/246 AP/NP over a rather rolling course. Dusty raced Wildflower today. It was his first run over 45 minutes in 3 months. I’m relieved to say he had a solid race and seems to be back on track. WF is no easy course. I was nervous how his groin would hold up on the brutal run course. Now it’s time to sit on my hands and wait for Kerry’s results for St. Anthony’s tomorrow and James’s results from the MayDay Biathlon in NC he is racing. I’m hoping she snags the top amateur age group spot again and I predict he has a solid shot at the overall win. This is also my first blog post on the new Mac. Exciting no doubt, probably more exciting for me. It was fun! It was fun to finish as well. I guess the best part was the sushi followed by ice-cream.